Express your fabulous style with a unique Mitzvah invitation. Mitzvah invitations do more than invite and inform guests—they express your fabulous style and set the tone for your ceremony. We understand how personalized you want your invitation ensemble to look and feel. 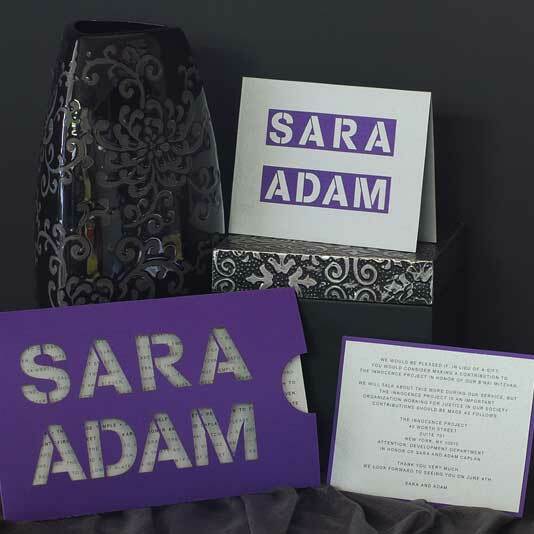 We would be delighted to work with you on your Bar or Bat Mitzvah invitations. No matter your budget, we can work with you to make something that speaks in your voice and matches your style. Additionally, we carry matching response cards and thank you cards. These will easily incorporate into your Bar Mitzvah stationery. Together in my Weston studio, we can create the perfect Mitzvah invitations that are uniquely you. We’ve proudly served Connecticut, including Fairfield County + Westchester County for over 28 years by providing customers with unforgettable wedding Mitzvah suites. Take a look at our Reviews to see past clients we have served in the area that have been delighted with our services. We’d love to work with you on your Bar or Bat Mitzvah invitations. Fill out our contact form to get in touch. Please fill out the form to the best of your knowledge letting us know about your upcoming Mitzvah.